Spotted in a tiny box in Martha Stewart Living's latest issue was such a simple, clever idea I had to share. 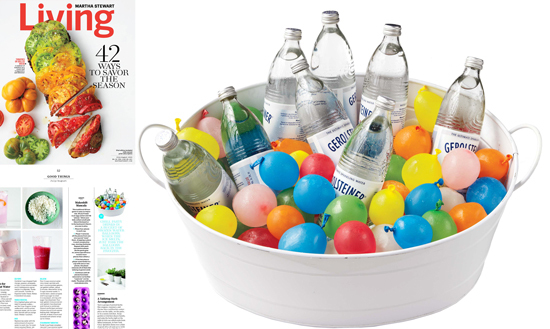 Instead of using ice, freeze water filled colorful balloons to use between your beverages. A nice pop of color and once they melt, the ensuing water balloon fight will be a great way to cool off! ps: on the topic of entertaining, I've asked a few of my favorite bloggers to stop by next week with their favorite entertaining trick. Stay tuned - I hope you'll enjoy them as much as I do. Love this idea - and totally using it for my daughter's birthday party this weekend. Thank you! I saw this, too, and loved it! Are you planning Halloween yet? Yes, Halloween is on my todo list now. I just have to figure out a costume for myself and Ill be golden. What a cute idea for a party...especially a kids party! what a great idea! such a fun way to add some color :) xo jillian Stop by cornflake dreams i'm hosting a minted giveaway! I actually tried this at my last party. It's definitely cute, and I would certainly do it as Martha does with smaller sized balloons (otherwise they don't really fit). The problem I had was that several of the balloons got brittle in the freezer and ended up splitting while frozen. I even bought sturdier helium balloons just in case that was an issue. Maybe it'll work better if they're not quite as full when frozen. Glad you had the same issue! I tried this for my last party too (about a week ago). My son's first birthday was balloon themed, so I thought this would be a fun touch. About half of mine survived the freezer. I thought it might be the brand as I was having other issues with the balloons I bought in a variety of sizes. It was the brand that Target sells, Spritz. Wow! What an interesting idea! Definitely must have a look! And....please...wait till they melt to have the fight.